Since her professional solo debut at age fifteen, Ilana Blumberg Thomas has appeared across the United States and internationally. Highlights have included solo appearances with the San Francisco Symphony and the Albany Symphony (NY), as well as performances at the prestigious Santa Fe Chamber Music Festival, the Marlboro Music Festival, the La Jolla Summerfest as a ‘Rising Star’, the Aspen Music Festival, and many others. Ms. Thomas was a three time fellowship award recipient at the Tanglewood Music Center, where she was rewarded the C.D. Jackson Memorial Prize for outstanding musicianship. As an orchestral musician, Ms. Thomas served as a tenured member of the first violin section of the Springfield Symphony Orchestra (MA) from 1996-2005. Ms. Thomas also served as the associate concertmaster of the Albany Symphony Orchestra for seven seasons, including one as acting concertmaster. 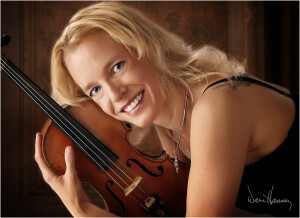 She has additionally performed as a member of the NYC chamber orchestra Philharmonia Virtuosi, with whom she toured internationally, the Modesto Symphony Orchestra, where she currently serves as assistant concertmaster, the Sacramento Philharmonic, Symphony Silicon Valley, the Marin Symphony, and the California Symphony. Current chamber music projects include regular performances as a member of Golden Gate Music. Ms. Thomas’ diverse interests are reflected in her many other performance experiences; she has participated in Broadway productions in New York City, including the original productions of Aida, the Producers, and the revival of The Bells are Ringing. She appears on the Broadway Cares benefit album “Home for the Holidays” and on the debut solo release by Broadway vocalist Lauren Kennedy, “Songs of Jason Robert Brown”, among others. She has recorded and performed with independent rock, blues, and country bands, including featured performances on electric 5-string violin, and currently performs and records on acoustic and electric violin as a member of the band of rising indie rock sensation Doe Eye. Additional recording experience has included projects for numerous labels, including Deutsche Grammophon, Argo, and Albany Records, with renowned producer John Vanderslice, for film, and for the Nickelodeon cartoon, “The Backyardigans”. As an educator, Ms. Thomas has maintained a private music studio for the past twenty years, and was formerly an adjunct faculty member at the State University of New York (SUNY) Albany. Ms. Thomas began her violin studies at age two in Berkeley, CA. Her musical education continued at the San Francisco Conservatory Preparatory Program and the Oberlin Conservatory.